He is reading our hearts. we are filled with His radiant light. Pick a hat and join the fun at the TeaCup Living table. Tea-time gatherers are extra special when topped with a hat. 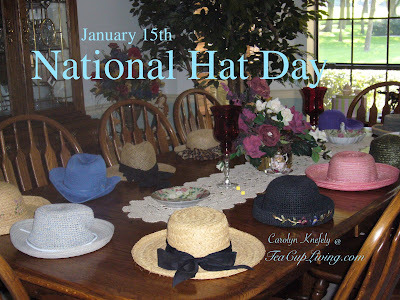 Even if we can't be together on National Hat Day, I hope you'll pick a hat on the table and share why it's your pick. The power blue one is for me. Being able to adjust the brim is especially fun. Nevertheless, each one of these hats hang on my mud room wall. Each one has a personality and set my mood when I don it upon my head. 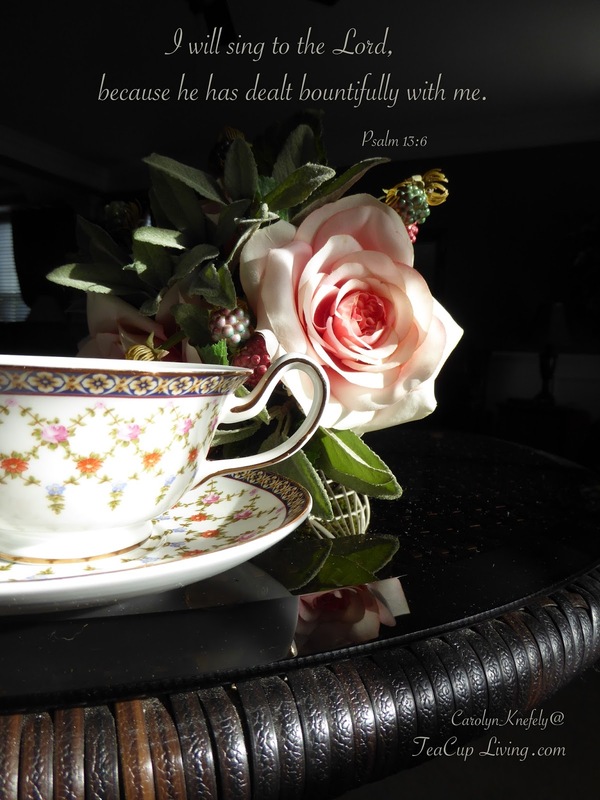 They cause giggles and laughter when tea-time guests see them waiting for them on the table. Conversation starters are easy when these toppers show up. More hats line my closet shelves. One I call "Perky" because she lifts my spirits on a rainy day. Her colors are bright as well as having a very flexible brim for me to hide behind when turned down so I don't drown. Her adjustability is great when the sun comes out. Lifting a part of the brim and tilting her to one side of my head makes her look a bit sassy. Nonetheless, she's a lady with grace and class rain or shine. Hats brings giggles instead of grumbles. Hopefully, some day we'll be able to have tea together - with or without a hat. You're always welcome at my table. The tea has steeped to perfection. The cold winds blow loud with little cheer. The outside chill is beating at the windows and doors. to pause with my cup of tea. Steeping in this peace filled moment, I pray for those who are out in the cold world lost without knowing the comfort of the Lord and His bountiful provisions. Lost time in prayer has caused my tea to become cold. It doesn't matter, immersed in gratitude and prayer was most satisfying. 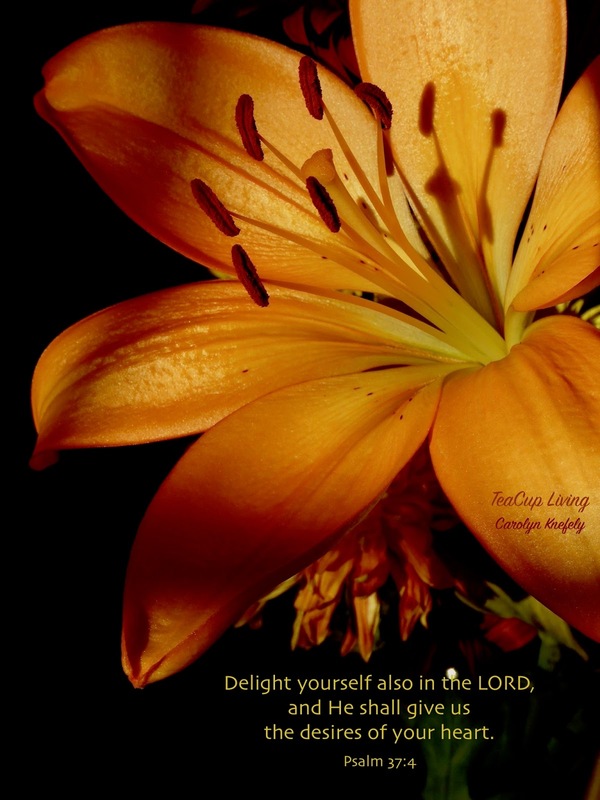 My prayer for you and your personal pauses in Christ's uplifting presence is to be filled with rejoicing experiences. This season of cold winds and chilly days are best endured steeped in scripture, prayers and gratitude for they never turn cold.